I must admit I was extremely excited about this gig. Dan Boeckner's (as it turns out) real band, Wolf Parade, made one of the best albums I heard in 2005 and as such I was hoping and praying for my favourite Parade songs in between Handsome Fur's own. The place was less than half-full (a shame), and as such I line up down the front to watch this event unfold. Oooh yes, sir, better believe it. There is something inherently endearing about happy people speaking french. Malajube are happy, and gleefully bash out charmingly positive-sounding songs like no tomorrow! 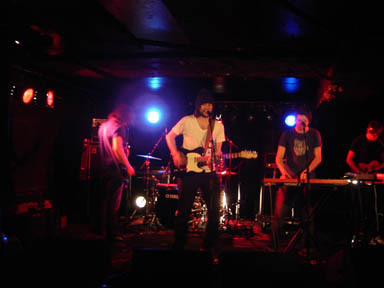 Guitars jangle and jump, the bass booms and keyboards howl through a noise straight out of (the ever trendy) Montreal. Certainly there are comparisons to be made to other and vastly more famous bands from the same area, but I don't think just going "Oh, they sound like The Dears mixed with Wolf Parade and the joy of playing known from Arcade Fire" would suffice. Besides, such things are just lazy. Up until this point I had never heard this band. I even thought they were Wolf Parade until they mentioned they only sang in French. Oh, and the distinct lack of any Wolf Parade members did kind of tip me off early on. Starting off with a choppety-chop rhythmic guitarpop song (that's how it went!! ), the band treats the audience to a delightful 30 minutes of great songs that made me and surely a few others buy their equally delightful album post-gig. Malajube are the type of band that can combine a plethora - that's right. A plethora - of styles and influences into one song and still make it sound consistent (without going prog). The magic first happens in a song I later find out is called "Pâte Filo". It starts of like a slightly melancholic poprock song with some nice guitarwork, heavy drumming and chiming synths before HIGH PITCHED WAILS pierce the tranquility in a way that makes you sit up, look around you and feel the heartstrings stir. You could feel the magic! It is always hard to describe music you, dear reader, probably will not have heard. Furthermore, it is difficult to describe how this music makes me feel when you, most likely, will have no point of reference to connect the music. The only thing I will say is that seeing and hearing Malajube live is like the first time you hear Arcade Fire or Radiohead or the Smashing Pumpkins or whoever your favourite band might be. But nicer. And French. Excellent. The only downside to this gig was the fact that is wasn't long enough. I wanted more. I also wanted more people to see this band. Wow! "It was strange, constant blue and the same. ghost. every night" croons Dan Boeckner on the Handsom Fur's opening number, incidentally a Wolf Parade song, "Same ghost every night". It later transpires that the Handsome Furs is a band consisting of Boeckner and his fianceé that is touring solely so they could go to Scandinavia. Aww, isn't love sweet? Despite the "band" only being Boeckner, his aforementioned fianceé and a couple of synths and drum machines, it is still a good gig. Boeckner sings like Springsteen did back in the day, writes songs to rival The Boss' best, and even "destroys" one of his songs in a slightly drunken tribute in between talking of drinking "aqua vite" - a form of Norwegian tequila you drink at New Year's parties and is best reserved for alcoholic grandparents. It is a gloriously shambolic ensemble that is so intimate that I am left thoroughly glad I went. "Modern World" is another of the three Wolf Parade songs on show tonight amongst a smattering of new songs at least I hope will end up on a future Parade release, if not on a Handsome Furs release. These songs display an ever growing songwriting talent that is rare and precious. 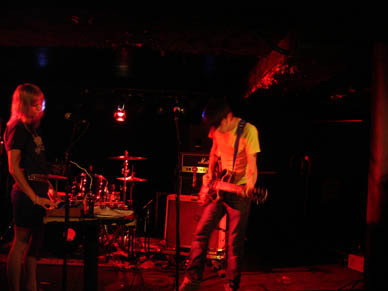 Of course, the fact that it's just Boeckner, a guitar, a drum machine and some light synthing does compound the matter slightly, and it seems unlikely to think that the songs could be anywhere near as good as they would be when played by a full band on full tilt. Still, it was a remarkably intimate and joyous gig. You should have been there. If only to say you've seen Boeckner solo. It seems Montreal can still summon up surprises, even after all the bands in the world pretend to come from there. what other wolf parade songs did they play and do you know the name of any of the handsome furs songs? I think "Same Ghost...", "Modern World" and "Shine a Light" was about it, really. As for Handsome Furs songs, I think they might all end up as Wolf Parade songs. I traveled around Iceland with the Handsome Furs and they kept on saying how much they loved touring in Scandanavia. One of their very good song is Hearts of Iron. You can watch the episode about the Hansome Furs on my WebTV show, La Musique Spin le Monde (Music Spins the World) on www.33mag.tv starting January 30th.... and Malajube is the best band of Montreal (Quebec).... we love them.